Yesterday was the day for First Holy Communions at our local parish! The Mass was just beautiful, and the First Holy Communicants were all glowing! I'm so glad that we were able to attend. During Mass, I was holding my baby, and since I have not gotten use to my new camera, I only took one picture as the children were processing out of the church. After Mass, the parish hosted a reception. I just love this photo of Sugar's sister Boo holding Twinkle Toes. Captain is even more excited as we finish preparing for his own First Holy Communion on the 30th. 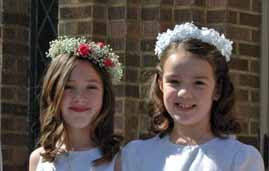 Congratulations to all of the new First Communicants! May Our Lord give you all the graces necessary for the sanctification and salvation of your souls! Soul of Christ, sanctify me. Body of Christ, save me. 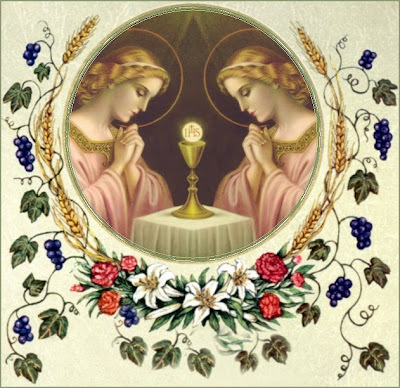 Blood of Christ, inebriate me. Water from Christ's side, wash me. Passion of Christ, strengthen me. O good Jesus, hear me. Within Thy wounds hide me. Suffer me not to be separated from Thee. From the malicious enemy defend me. In the hour of my death call me. And bid me come unto Thee. That I may praise Thee with Thy saints and with Thy angels, forever and ever. Amen. thank you for coming to my First Communion! It looks beautiful, congrats to your little sweetie!! I love hearing all these stories on the BLOG world. Feels like I am not alone and there are others out there that love our faith! MN Mom, Margaret's priest Fr Thomas Dufner distributes Communion by intiction also! He's a wonderful priest! Hubby and I were just talking about this today! Tongue vs the hands. I prefer to receive on the tongue, he has been receiving by hand, but he is thinking of trying it. Everyone has their own convictions. My son is so afraid of the Host dropping off his tongue, so he takes it by the hand. Love the pics, congrats to them all! Hope your hubby is doing ok, still praying!! I bet you cant wait for the trip to Cowboy's First Hold Communion!! =D And by the way I love the pictures!